Founded in 2014 by TAIGLOBAL Group, our MRO Accessory Division (Bainbridge Aerospace) brought together leaders in the Black Hawk repair and maintenance community to build a company that has the experience, knowledge and tools needed to be the best international repair facility. We specialize in the airframe, hydraulic, and critical safety systems of the Black Hawk helicopter. This comprehensive repair expertise includes work on Vaneaxial Fan Assemblies and Driveshafts. In addition, we are approved to work on aircraft under ISO Certifications. Our MRO Accessory Division has over four decades of experience in aircraft repair and maintenance. They make up a fantastic team with over 100 years of combined experience to work for you. Our team members have a vast amount of government and military experience, with a passion for helicopter repair and maintenance. Ensuring compliance for our international customers, our MRO Accessory Division is an ISO 9001:2015 Certified Repair Station. We specialize in repair and overhaul of parts and components for numerous aircraft including the UH-60/S-70 for our global customers. 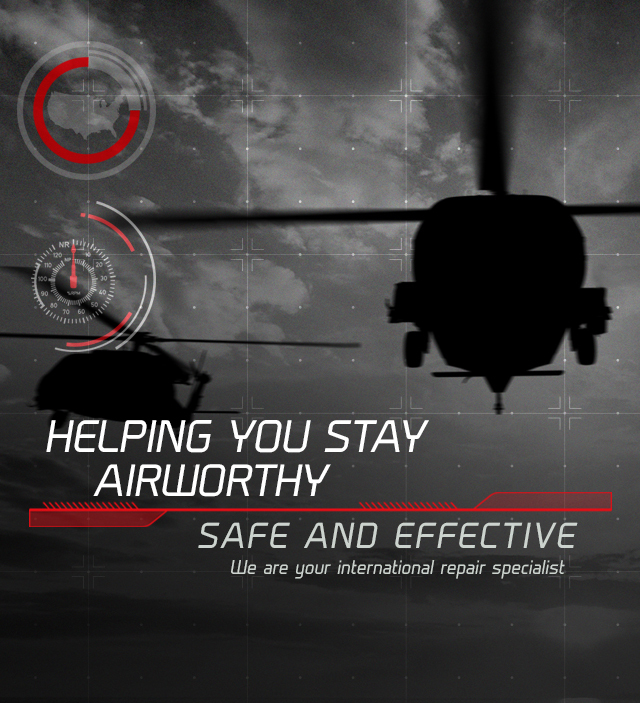 With the TAIGLOBAL Group team behind them, the MRO Accessory Division is in the perfect position to assist government and military organizations with the repair and maintenance of their UH-60/S-70 Black Hawk fleet, regardless of location. Our team receives constant training to ensure that they are up-to-date on the most recent technology and techniques to provide you with world-class service. Our company is focused on keeping your aircraft flying safely and will do whatever it takes to make sure you are in the air. Helping you complete your mission is our mission. can be sure that you are receiving the best. take not only the latest in data, material and processes, it also takes a highly critical eye. because with blades, there is no second time! very qualified candidate for your requirements. Critical safety systems are at the core of our MRO Accessory Division. We specialize in critical safety item overhaul, repair and maintenance of the UH-60/S-70 Black Hawk helicopters. The vaneaxial fan assembly and all drive shafts are dynamically balanced at over 5,000 RPM in our facility. We also provide minor composite repairs on main and tail rotor blades. We understand the importance of perfection in the systems that keep you in the air and will help prevent catastrophic system failures before they happen, making your fleet safe and effective. If you have any questions about your critical safety items our experienced technicians are standing by to help you make the best choices for your helicopters. We have the experience, tools and knowledge to perform all your structural repairs for the UH-60/S-70 Black Hawk helicopters. Our experienced technicians provide complete airframe repair including all composites making any minor or major structural damage appear as if it had never happened. We strive to keep your helicopter fleet working and looking like new, saving you time and money without sacrificing safety and efficiency. The vaneaxial fan assembly and all drive shafts are dynamically balanced at over 5,000 rpm in our facility. We also provide minor composite repairs on main and tail rotor blades. Our complete in-house repair facility is equipped to handle all of your hydraulic system requirements. We are able to overhaul or repair your complete system including pumps and valves to keep components working like new. Every Black Hawk crew member is familiar with the smell of hydraulic fluid due to bad hoses and seals, but our MRO Accessory Division we make sure that all the fluid stays where it is designed to, doing what it needs to. If you have any questions about your hydraulic systems, we have experienced technicians standing by to assist you. Our MRO Accessory Division is certified to conduct repairs under ISO qualifications making us the perfect U.S. company to perform repairs on government and military aircraft worldwide. Our team of highly experienced repair technicians are at your disposal to keep your fleet in the air, safe and at the highest level of efficiency. The experienced team in our MRO Accessory Division specializes in critical safety systems, airframe repair and overhaul, and hydraulic system repairs for the UH-60/S-70 Black Hawk helicopters. Each member of the team has years of experience in working with Black Hawks and was selected based on performance and professionalism. We have team members standing by to take your call if you have any questions regarding your helicopters or would like to learn more about our ISO Qualified Repair Station. The MRO Accessory Division puts over 100 years of experience at your fingertips to ensure that you have exactly what you need, when you need it. Our location in South Texas is near international airports and several major U.S. Interstates giving us easy access to anywhere in the world. Our team will assist you with any logistical, import or export questions you may have. For more information about our MRO Accessory Division, or if you have any questions regarding the UH-60/S-70 Black Hawk Helicopter, please contact us today. We have experienced technicians standing by to assist you.